The title and photo say it all. Indeed NEMTs Life Member, Dr Adam Watson has been hard at work this year to write and publish five new books. We reviewed COOL BRITANNIA in our 2011 Spring Edition of Mountain Views with the cover photo of that edition being from that book. Dave Windle, our Chair, reviews 2 more here. You will have to wait for our Spring 2012 Edition for a review of the last 2, namely A SNOW BOOK, NORTHERN SCOTLAND and VEHICLE HILL TRACKS IN NORTHERN SCOTLAND. But Christmas is coming folks, what finer gift than one of these! This book is a glorious tale of long ago, of an era that has now passed. It is interesting and informative on all aspects of life in the Cairngorm mountains and glens. It talks of local heroes that people such as myself remember as icons but never really knew. People such as Bob Scott and Tom Patey are brought to life in a vivid and fascinating way. Adam Watson was on equally good terms with national heroes such as Tom Weir and Seton Gordon and talks about them in the same style, bringing them to life and making them human. In between pieces on the local wildlife, there are descriptions of epic winter journeys, made at a time when there was typically more snow around than today. Some of Adams winter ski journeys were true feats of endurance. He was also part of the explosive development in Cairngorms climbing during the 50s and writes of his own role in this. He is more diplomatic than me when referring to Pateys traps for those who believed his grades and tried to make early repeats. This mixture of wildlife and mountaineering is interwoven with accounts of life in the glens at that time and with accounts of Adams own life in Aberdeen as he was studying for his degree in Zoology. 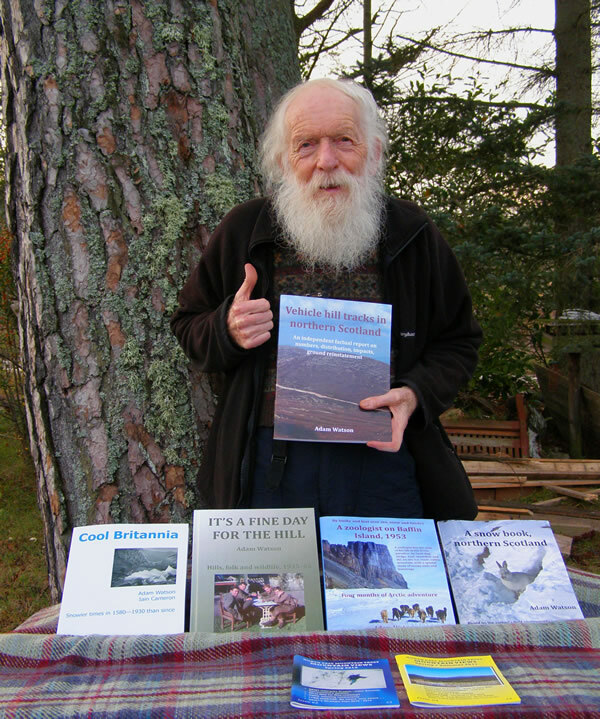 Adam Watson stands as a true giant of the Cairngorms and this book puts the flesh on the bones of that status. Read it and you will know the Cairngorms for the better. This is a fascinating account of an expedition to Baffin Island. It talks of expeditions as they used to be, before society moved to a more safety conscious mode as it is today. The book recounts the expedition day by day and is packed with information on the wildlife that Adam Watson was studying and interesting observations, still relevant today, on aspects such as how populations adapt to changed circumstances. It ranges from dog-sledging to endurance journeys with no food and gives an insight into expedition life before modern communications and transport altered thing for ever. The camaraderie between the different team members comes through in almost every page and the reader is left with an understanding of the very deep bonds developed during the expedition. Baffin Island is now a changed place but the charm of this book is in its description of the expedition itself. I was lucky enough to join an expedition to Greenland some years later and this book brought back many memories. Another account of an era that has now passed. MacIntosh Plant Hire sponsored the first 4 of these books and NEMT sponsored the epic VEHICLE HILL TRACKS IN NORTHERN SCOTLAND. More to follow! Now this account would not be complete without this wee addendum. When I was taking the photos Adam asked me if I were ever to get lost in the forest would I know how to find my way out  to which I answered Probably Not! 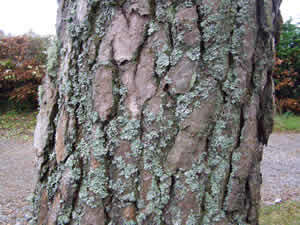 ! Look says Adam On the South side of the tree there is no lichen, come round here to the North side and its covered with lichen. So I checked all the pine in the garden  and sure enough they all showed the same differential. One way to keep your direction in a straight line for sure  how amazing is that? 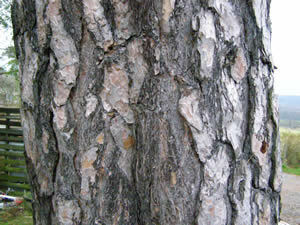 The photos here are of the tree we used for the main photo  yes, you are aye learning with Adam!! Some of Adams books are for sale in the Deeside shops, including Hilltrek in Aboyne, the antique shop in Dinnet, Deeside Books in Ballater (which has them all of them - see their advert on our outside back page, on-line ordering also) and Braemar Mountain Sports. Adams books are also available on www.amazon.co.uk where Adam even has his own profile. His book on Grouse, co-authored with Robert Moss, is in (or on?) Kindle!